Morel mushroom hunting is a wonderful, healthy outdoor experience to share with family and friends. Not only is it the best-tasting, the morel is also the easiest to identify and safest to eat of all wild mushrooms. Generally, if you find a sponge-like protuberance, 1 to 6 inches tall pushing skyward among fallen forest leaves and grasses on spring days between 60 and 80 degrees, you’re in luck. The stems and caps of morels are hollow, and the stem is attached at the base of the cap. It makes a great first mushroom to learn because its spongy shape is so distinctive and easy to identify. Below are some tips that will help you find, properly forage, preserve and prepare this illusive mushroom. Morel Habitats: Morels have a diverse range of habitats. Forests, fields, orchards, fence rows, hedgerows, islands, railroad tracks, floodplain’s and grown-over strip mines are just some of the places the white and giant morels can be found. They sometimes tend to congregate around certain types of trees, usually ones that are in some stage of dying. Elm, ash, sycamore and cottonwood. Usually bigger, older trees. As the trees die, the root systems break down and are desirable and readily available food sources for morels. This availability of nutrients may allow the growth cycle to advance, shortening the five-year cycle. Good results occasionally can be found in consecutive years in the same location. Hence the oftenly tipped off “burn area” morel growth habitats we hear of in Montana. 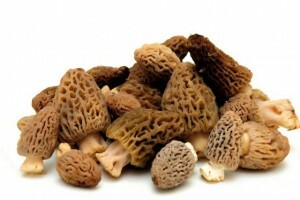 Foraging Tips: While hunting morels, the most important item you can bring along is your collection bag. Do not use paper or plastic bags, even though they’re handy and inexpensive. These bags don’t allow mushroom spores to return to their natural habitat. A mesh bag will keep your mushrooms fresh and let those thousands of spores fall back to the ground. The numbers of morels (where they’ve previously existed) have steadily dwindled over the past 30 years. Deforestation and pesticide use are partial culprits, but the biggest factor has been human beings removing the “seeds” from the woods in nonporous bags. So use mesh and tell other people why it’s important. The spores are microscopic. The cap of each morel contains 250,000 to 500,000 spores. These spores must become airborne and then find adequate nutrients, soil and moisture. The odds of successful reproduction are slim, but people can help the process by using mesh bags for their “catch.” Sidenote, it’s a fallacy that pulling a mushroom out by its roots will prevent another from growing there next year. The “root” system that brings the mushroom to the surface is a one-time, one-way system. It deteriorates through winter and spring thaw, and is replaced each year. Cut or clip the morels at the base to keep them clean. Preserving/Preparing Morels: The easiest, longest-lasting method of preserving morels is drying. Place your unwashed, young, healthy specimens (whole or cut in half) on a nonmetal screen directly in the sunshine and raised off the ground for air flow. Hard or reflective surfaces (like a deck or driveway) below your screen will help dry the mushrooms more quickly. Set them out early in the morning. Remove mushrooms before sundown. The process usually takes eight to 10 hours, depending on conditions. Place completely dry morels in paper bags to store. If you keep them dry, they’ll last for years. Rehydrate in cool water for at least two hours. Use the caramel-colored water for soup, stock and gravy. Two ounces of dried morels will rehydrate to 1 pound. Do not leave drying or dried mushrooms outdoors overnight or allow rain to get on them.Do not wash the mushrooms before drying. The moisture can change the chemistry, making the morels hard and dark. Morels can also dry indoors on screens, but the process takes longer. Provide heat and air if possible. If you’re concerned about bugs inside the mushrooms, cutting the mushrooms in half and placing them on a screen in the sun will eliminate critters. Morels also can be frozen. In a frying pan, saute onions or garlic in butter or oil. Add mushrooms and half-saute them over high temperature. The liquid from the morels will create a soup. Remove from heat, cool, put in plastic, resealable bags and freeze. To re-use, put the frozen mixture into a hot frying pan and finish the sauté.